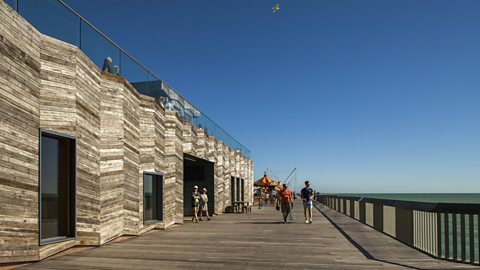 Hastings Pier has been unveiled as the winner of the prestigious Royal Institute of British Architects (RIBA) Stirling Prize, in a ceremony at London's Roundhouse. The pier - rebuilt after a devastating fire in 2010 - has been reimagined by dRMM Architects as a multipurpose space. Hastings Pier, on the East Sussex coast, dates from 1872. It closed in 2008 following storm damage, and faced destruction two years later when a fire ravaged the structure. London-based architects dRMM won a RIBA design competition to reimagine the pier, and fundraising from a local action group found 3,000 shareholders to buy a £100 stake in the project. The new-look pier was repaired, rebuilt and creatively reimagined. The 19th century structural iron work has been painstakingly restored, and the surviving Victorian Pavilion has been transformed into an open-plan café-bar. The vast pier deck has been set aside as a flexible expanse for concerts, markets and public gatherings, while the new timber-clad visitors centre has a viewing deck on its roof. The architects used timber reclaimed from the original pier throughout the project. Maria Ludkin, chair of the Hastings Pier Charity, added: “Hastings Pier is both a symbol of regeneration achieved when communities work together and a beautifully designed canvas to realise multiple uses for residents and visitors." A new life for Scotland's greatest modernist ruin. An archive film tribute to the late architect Zaha Hadid. Peter Marlow on photographing all 42 of England's cathedrals. Razia Iqbal speaks to Norman Foster, David Adjaye and more. Elain Harwood explains why Brutalism can be beautiful. The RIBA archive in pictures. Oscar Wilde's best quotes and words of wisdom.